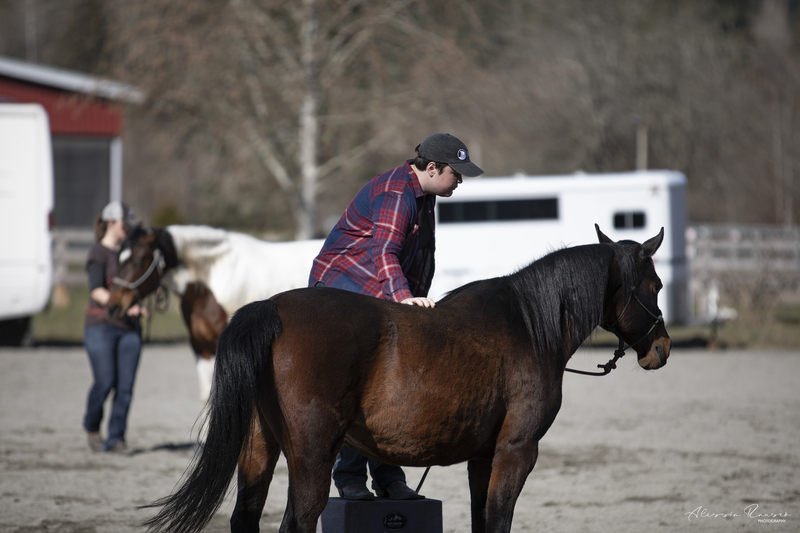 Cameo was a star pupil at our horsemanship clinic this past weekend. 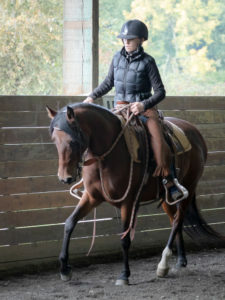 Kaya has been working with her for the past few weeks, conditioning and strengthening her for riding by working in hand over trot poles and through groundwork. We have ridden her a bit too but had not been constant through the winter. Joel helped Cameo and I work through some of her braces while being ridden. She made some significant changes with his help and by Sunday felt and looked like a completely different horse. She was smooth, with a relaxed neck and shoulder, had an absolute lovely soft gait. 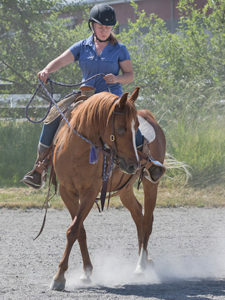 She was able to feel easily through the transitions from the walk, trot to the lope and down again. It was a very special weekend for her, and I am excited to see her progress this year. 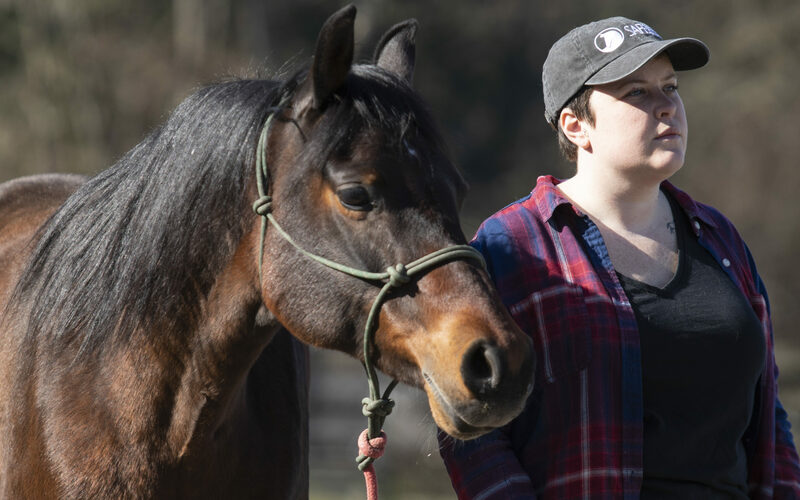 I recently started working with Cameo on groundwork and was able to learn with her in the groundwork section of the Joel Conner clinic. This was a great opportunity for me to practice with a super sensitive horse and it was a fun experience! 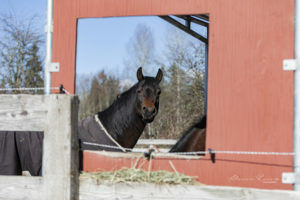 During the first hour or so on Friday, Cameo was spooked by the sound of another horse in the trailer that was practice loading. This moment, combined with the information that she had been difficult to load in the past, led me to believe that we would have our work cut out for us when her turn came to practice loading, but I was pleasantly surprised! Joel worked with Cameo first and his method was so effective. Making outside of the trailer work and inside of the trailer peaceful had a huge effect on Cameo. I continued working on this the next few days and by Sunday, Cameo was practically loading herself and licking and chewing in the back corner of the trailer. This was also a great learning moment for me as Joel showed me how to be safe about loading and get out of the way of danger when necessary. Cameo and I also worked with a tarp a lot. While she needs more of this exercise, by Sunday, I could throw the tarp over her while she stayed relatively relaxed with an even, balanced walk. 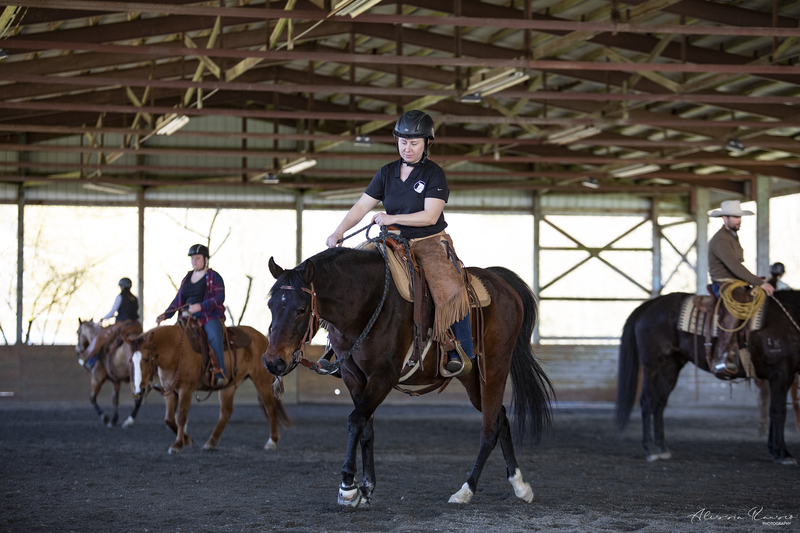 The final exercise that Joel had us working on Sunday was one of my all‐time favorite moments in a clinic. It was simply working on backing up, but with a focus on getting this movement with as small a cue as possible. At first, I didn’t think much of it; this is one of the first things that Terry taught me, and I felt like I had a really good handle on it. But Joel noticed how on the ball Cameo was and asked that I try to get her to back up without even a perceptible hand motion. Cameo hooked on to this quickly and soon we were backing up off my feel alone. It was kind of indescribable. Being able to look at this horse, whose default is generally looking anywhere but at me, and feeling like she was tuned into my thoughts and waiting for me to ask her to move was amazing. 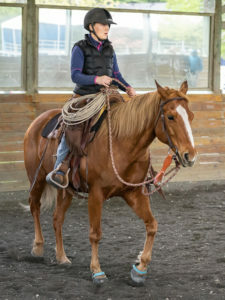 I’m grateful for this experience with Cameo, she is definitely a special horse! Working on leading up to the mounting block.